Ready for 4K/8K, the MFR-3000 enables compact system building that requires fewer cables and leaves more rack space (using input / output option with 12G-SDI) and more outputs for production (using innovative multi viewer output). This routing switcher that builds on the solid performance of our larger MFR-5000/8000 units through redundancy and easy maintenance. Can be expanded by 8 inputs or outputs at a time, up to 64x64. In mixed environments, audio modules can also be added. * Designed for mission critical broadcast facilities, additional environments include hospital surgical rooms, corporate meeting rooms, and research centers. An optimal solution in midsize systems where variable input/output capabilities and mixed signal formats are used. 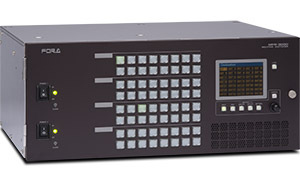 A MFR-16MV multi viewer output card (option) has been added to the MFR-3000, to add a multi-viewer environment, and to contribute to reduced rack space and cabling. *Narration is in Japanese only. English closed captioning is available on this video. Enter "Settings" and select "Subtitles/CC" to turn ON your English subtitles. Using the MFR-16MV multi viewer option, except for number of multi viewer monitor output, the remaining output can all be used for production, without having to assign output lines to an external multi viewer. As with our MFR-5000/8000 routing switchers, this unit provides standard support for 3G-SDI (Level A/B), HD-SDI, SD-SDI, and ASI input and output. No need to worry about signal formats, thanks to auto signal detection. Install up to 8 input and 8 output cards, into a maximum 64-input/64-output matrix. 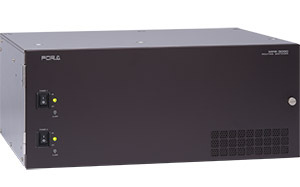 Use up to 4 inputs and 4 outputs at 8K, and 16 inputs and 16 outputs at 4K (QFHD). Support for AES/EBU, analog audio, and multi-viewer (monitor output) via additional I/O cards. MFR-8SDI: 8-input card supports 3G/HD/SD-SDI and ASI input. Capable of cable compensation. MFR-8SDIGB: 8-input card enables support for 12G/3G-SDI, 2-input ports supporting 12G-SDI and Gearbox. MFR-8SDO: 8-output card supports 3G/HD/SD-SDI and ASI output. MFR-8SDOGB: 8-output card enables support for 12G/3G-SDI, 2-output ports supporting 12G-SDI and Gearbox. 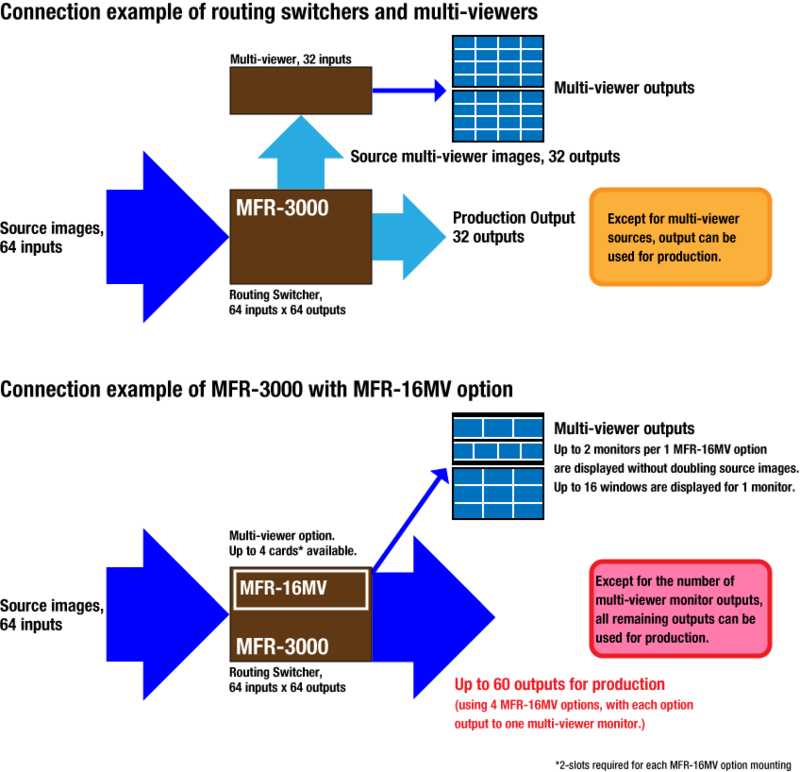 MFR-8MV: Multi viewer function card supports Max. 16-split window and customize layouts. MFR-8AAI: Input card supports 8 stereo pairs (16 channels) of analog audio input with A to D conversion function. MFR-8AESI: Input card supports 8 stereo-pairs (16 channels) of AES/EBU input. MFR-8AAO: Output card supports 8 stereo pairs (16 channels) of analog audio input with D to A conversion function. MFR-8AESO: Output card supports 8 stereo-pairs (16 channels) of AES/EBU output. Redundancy in routing switchers is the core system requirement that ensures continuous operation if problems arise. Parallel operation of two routing switchers ensures matrix redundancy and enables quadruple redundancy of the power supply unit and CPU board. Can be integrated into an SNMP monitoring system. Enables monitoring of various operational states, such as power, fan, and CPU status, SDI signal input or output, and crosspoint errors. SNMP traps are sent to a manager if system failure and recovery occur. A built-in Web server enables immediate setup and eliminates the need to install software on external devices. Using this interface, settings can also be configured in offline environment. Equipped with a control panel for convenient crosspoint switching from the front. Can be remote-controlled through the Ethernet or serial ports. Compatibility with common protocols such as TSL and Harris allows tally linkage or auto source name tracking for crosspoint switching.